Simple instructions help homeschool parents teach the motivation behind and steps involved in bartering and trade, illustrate the concept of supply and demand, explain why people work and the ways they earn money, and other foundational aspects of economics with this Elementary Economics for Third Grade homeschool social studies course. Common books, hands-on activities, games, and more make sometimes complex concepts in economics clear for elementary homeschool students. 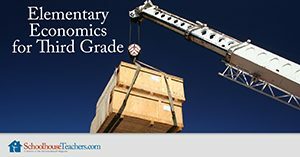 Elementary Economics for Third Grade homeschool social studies lessons use common books and hands-on activities to teach students fundamental concepts in economics. Week Seven: What Does It Mean to Produce and Consume? Have you ever traded with a friend? Maybe you know someone who has traded a lollipop or piece of candy for a cool pencil. This is an example of bartering. Bartering is trading without the use of money. In order to properly barter with someone, both people need to have something the other person wants, and they have to be of equal value to both parties. This week, we are going to learn about international trade. This is how the United States of America and other countries trade goods and services all over the world. International trading between countries can yield many benefits. It can help economically poor countries prosper as well as help wealthy countries get the resources they need. Sometimes countries decide to make a trade when they do not have the resources or the ability to fulfill their needs and/or wants. Remember a need is something we must have to survive, and a want is something we would like to have, but can live without. Many times, a country that is very wealthy may have limited or scarce resources and a country that is economically poor may have an abundance of scarce resources. Can you see where a trade can be negotiated? Due to the growing number of people in the world and, oftentimes, our “unlimited” wants, we can cause scarcity to become an economic problem. When an item is scarce, it is in very limited quantities, meaning there is only a small amount, and then it is gone. When this happens, those items or resources become more expensive to buy. Coal, petroleum, and even water can be scarce. International trade has been going on for thousands of years. Nowadays, international trade is responsible for much of the growth and success of our modern world! Goods and services are imported internationally for many reasons. They may be cheaper or better quality than what that country can produce. Another reason for international trade can be that some goods may be more desirable than the local goods. Have you ever eaten a mango or papaya from your local grocery store? Many of these fruits are imported to us from Mexico. Another reason for international trade is that a country may not have any other option and the good or service they want does not exist in their country. For example, Japan has no oil reserves in their country. This is a big deal, especially since Japan is the fourth-largest consumer of oil in the world! All the oil they consume has to be imported from other countries. International trade has many benefits to a country. Trade encourages a country to specialize in producing the goods and or services they can make effectively. Creating a specialized good or service means a country can produce more volume of a product, which allows them to make more money for their economy when they trade. When we trade internationally, it increases competition, which lowers prices. Think about it this way: There are many stores that sell skateboards. Because of this, they all must keep their prices low in order to sell. If one store sells the exact same skateboard for $50.00 more than another store, the store selling the skateboard for $50.00 more will likely not stay in business long. Trading internationally can also produce more jobs for people to make a living. The quality of goods and services will increase as local monopolies (when one business controls the trade of a particular good or service) are eradicated. Having more countries offer the same goods and/or services will cause the goods and or services they produce to not only be at a lower price, but also to be higher quality. When we trade with other countries, we encourage each other to be imaginative and innovative as we share and create new technologies. International trade can help bring about prosperity, freedom, and even opportunity for each citizen. Let’s talk more about what it means to import and export goods and services. When countries trade internationally, they are importing and exporting goods and services. If you owned your own business, importing and exporting could grow your business where you live and also internationally. When a business imports and exports goods and services, they must pay close attention to our laws and regulations in the US. Any type of service, good, or resource that is made in one country and is sold to another country is called an import. If you own a business and you are looking to import a good or service into the US, you may need a license or permit depending on the specific item you are importing. In fact, some of the following items may require a special permit or license to import to the US: animals, prescription medications, food, and even trademarked items like name-brand shoes. Now let’s switch gears to talk about some specific facts on exports. Goods and services a buyer in one country purchases from a seller in another country are called exports. Just like with imports, exports can greatly benefit a company’s business. Also, like imports, it is vital to know and understand the laws and regulations when exporting goods and services. Some items need special permits and or a license to export. Items like software and certain technologies require a special license to export. Author, college professor, and former school teacher and administrator Brooke Layton created this Elementary Economics for Third Grade homeschool social studies course in a format that encourages young homeschool students to take responsibility for their own learning. As a former administrator and teacher, she led schools through the process of retraining students to think outside the box. Essentially, when students are given the responsibility for their own learning and strategically guided through differentiation in activities, they are able to retain more. They are also left with a versatile set of tools that can be applied across all content areas and grade levels. Therefore, my plans do not come with “worksheets.” I have, rather, created activities to accompany my plans. These activities allow students to have hands-on learning experiences. Consider the research behind providing learning based on students’ interests. Students are more willing to engage in meaningful dialogue and spend more amounts of time solving real world problems if they are interested in what they are learning. As teachers spend more time creating Inquiry-Based Learning opportunities, students become more involved in their own learning, and ultimately their learning is enhanced. “Their role is changed from passive listeners to active explorers, while the role of the teacher is changed from lesson instructor to problem-solving guide” (Ji-Wei, Tseng, & Gwo-Jen, 2015, p.282). What makes the learning in your home meaningful and worthwhile? When you envision yourself teaching, do you see yourself standing in front of your student(s) delivering content, or do you envision an environment where students learn through their interests based on themes you have strategically designed? Think about how you were taught in school. What were the subjects and activities that stuck with you throughout your adult life? Consider what that teacher had to do in terms of preplanning. I encourage teachers to create meaningful learning experiences for their students based on each student’s interests. This is not an easy task, but one that is essential for “out of the box” teaching and learning that lasts a lifetime. There is a lot we are still learning about the development of the brain, but one thing we have learned through time and research is that allowing students to learn through meaningful learning experiences has a lasting impact on their academic achievement. “Brain development is driven by environmental influences, and this implies that a lack of relevant experiences may have lasting influence on brain development” (Hart, 2008, p.53). “The brain is highly plastic, which means that its interconnections can be strengthened and enriched through a variety of approaches to education, paying special attention to developing skills involved in thinking and problem-solving, the arts . . .” (LeFrançois, 2012, p.266). This speaks volumes to the importance of developing these skills in students. The majority of the time, we focus on the functions of the left brain, encouraging students to read and comprehend at higher levels, use logic not only in math, but in every subject. Although this is important, we cannot forget the importance of the right brain. Children often learn through music and the arts things that will stay with them for a lifetime. Ji-Wei, W., Tseng, J. R., & Gwo-Jen, H. (2015). Development of an Inquiry-Based Learning Support System Based on an Intelligent Knowledge Exploration Approach. Journal of Educational Technology & Society, 18(3), 282-300. LeFrançois, G. R. (2012). Children’s journeys: Exploring early childhood. San Diego, CA: Bridgepoint Education, Inc.
Would you like to tell others about this Elementary Economics for Third Grade homeschool social studies course?